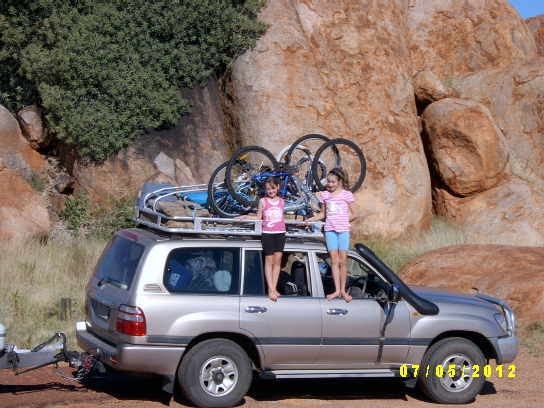 Our tow vehicle is a 2003 100 series diesel Toyota Landcruiser, towing a 2005 24ft Regal van. The van was purchased through the online Trading Post, while the Landcruiser was purchased privately after a great deal of searching. The Cruiser has an after-market snorkel, cargo barrier, bull bar, rear air bags, long range fuel tank, dual heavy-duty batteries and heavy-duty roof rack. The van includes 3 bunks (the bottom bunk is used for storage), a combined shower/toilet and, its greatest asset in my view - a front loader washing machine! 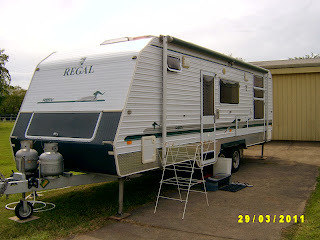 The washing machine alone would have saved us conservatively over $2500 ($4 load x 4 loads per week x 52 weeks x 3 years) and doesn't include extra loads of linen, sleeping bags when we've been camping, van curtains etc. $4 is also pretty average for a laundromat these days, with many now up to $5 per load and some caravan parks charging $6 per load. The van has three separate living areas, the kitchen/lounge/dining is in the centre, the bunks/shower/toilet/wash machine is at the front of the van and our bedroom is at the back of the van. The three areas are separated by concertina screens. Looking towards the bunks/bathroom, van entrance door is on the left with green curtains. Noticeboard was added before we began the trip. All the internal hanging clothing cupboards have been converted to shelves which quadrupled our storage capacity. One thing many so-called 'family' vans with bunks don't have is a decent sized fridge. We have a 160 litre fridge (we had a 520 litre in our house!). We have become used to it and purchase differently with just enough fruit/veg to last a few days and meat for a week only. The fridge is 3-way, running off gas when we are stationary, the car battery when we are on the move and AC when we have electricity. We do have an archaic Engel which we can use, but it seems to have morphed into a bar fridge only. under bench top. 160ltre fridge under the microwave. Another limitation with vans that are designed for four or more people, is they tend to have quite limited water tank capacity. We have 2 x 70lt tanks attached to the van and carry an additional 70 litres in a variety of containers. I suspect the reason for the smaller water tanks is about the overall weight of a large van, but many vans designed for a couple seem to have better water carrying capacity than large family vans. Lounge/dining/schoolroom, opposite the kitchen work area. We have a full annexe, which we have never erected. On the other hand, we regularly use the pull out awning, ground mat and side shade awning. We have two laptops, an iPad, a Bluetooth (used for amplification when we phone school), a touch phone and 3 iPods. We have a small inverter so we can charge everything except the main laptop from the van power supply. The van has a CD/radio player with 3 internal and one external speaker. It has a TV (mounted above the sink), however we decided to leave the TV in storage. We have recently purchased 2 freestanding 120kw solar panels and we have a 2 kva Honda generator. The van has a reverse cycle airconditioner. We carry two bikes, 2 boggie boards, scateboards, scooters and roller blades. Most of which get fairly regular use. We are carrying a large plastic box of board games which we never use, mainly because they are too difficult to get access to. We do play alot of UNO though. The toys I wish we had brought more of - Lego. We are a full-time travelling family of four - Tracy (Mum/navigator/tour director/home tutor/first time blogger), Larry (Dad/driver/cook/vehicle & van maintenance co-ordinator/home tutor), Elizabeth (currently 12) and Kate (currently 9). 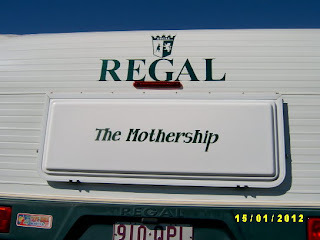 We sold our house in Warwick Qld, purchased a Toyota Landcruiser, a 24ft Regal triple bunk family van, enrolled in distance ed and hit the road on 19 February 2011. We've been keeping family and friends updated on our travels via Facebook, but after almost 18 months on the road, we've decided to make a more detailed record of our trip in the form of a blog (I'm a first time blogger so please be patient with me!). The blog will include greater detail about what we are seeing and doing as well as include some tips we have learned along the way which might make it easier for fellow families working through the mountain of information they have access to when it comes to seeing our great country. 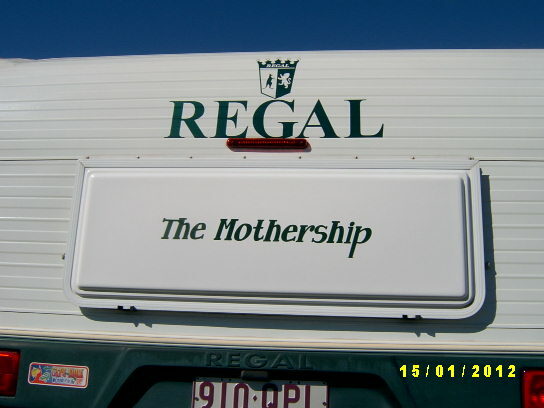 Our van is named "The Mothership", hence the blog name. Enjoy!